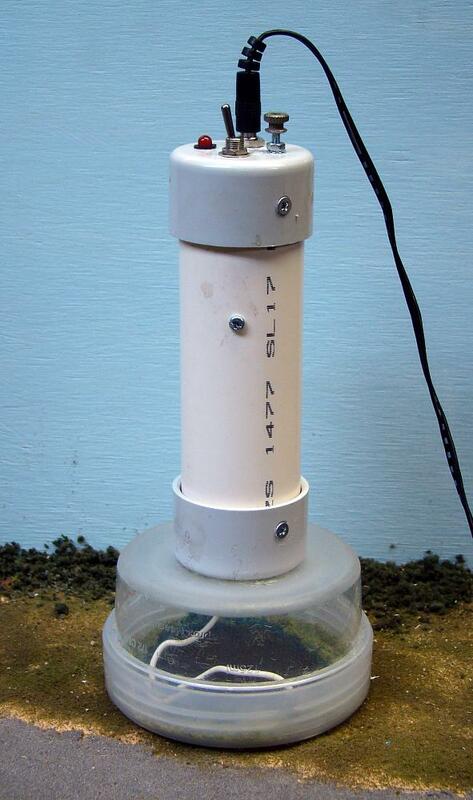 The finished static grass applicator, worked on during July 2011. Following on from last month's update, the mesh screen on the static grass applicator was now glued in and the applicator was ready to be tested. A scrap piece of plywood was used for the initial testing, mainly to show that the applicator works successfully. A couple of areas on one of the front modules were chosen and the grass applied. We found that the grass helps add a third dimension to the scenery already applied, and with more experimentation on grass heights and colours, this applicator will definitely get more use in the future. 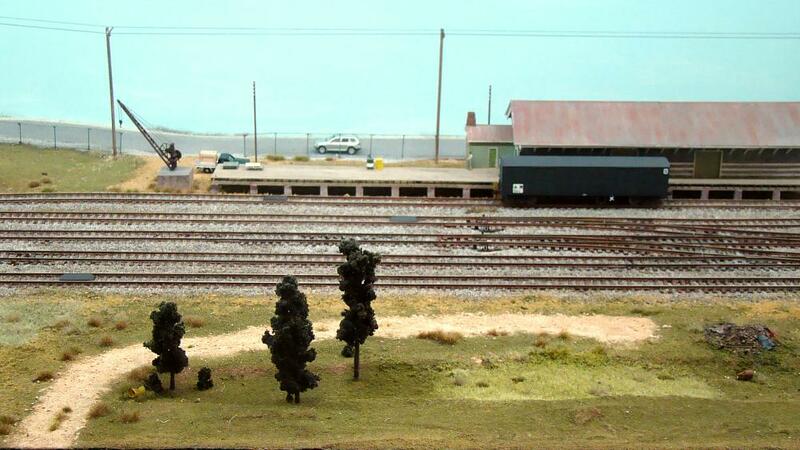 A mixture of colours and lengths of grass as added to the front of the layout by the static grass applicator. To left of the tree the vegetation atop the old stock race that was added last month can be seen. Whilst we were working on the scenery on the front module, a dirt access road was added to the front of the layout. Located adjacent to the Down Loop, the previous scenery was scraped off and leveled, and the road was made from coloured plaster. Plastic castings of rubbish piles were painted and weathered, and glued next to the new road, as well as next to the fettlers shed located just west of the road bridge. Long grass and weeds were then scattered around the road area to integrate the road and rubbish with the rest of the scenery. A single louvre van sits at the goods shed waiting to be collected by the next Pick Up train. In the foreground can be seen the dirt access track and piles of rubbish that have recently been added to this area. The dirt road is coloured plaster, and the rubbish is from Uneek and Ozzy Models. Silflor grass tufts in different colurs and heights have been added across the area. At the layout's last exhibition showing, we picked up a few packets of tufted grass of varying colours and heights. 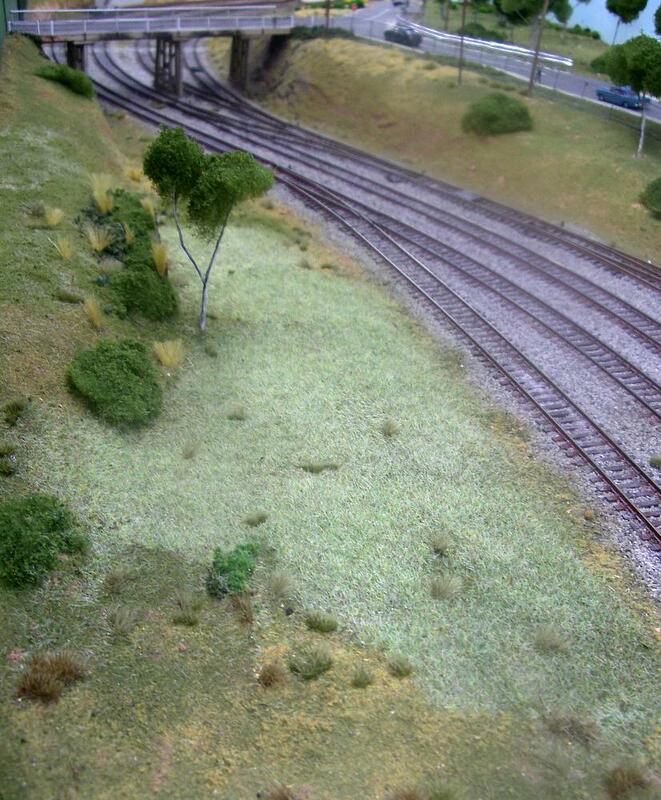 These grass tufts have slowly been appearing all over the layout.